The windings consist of the current-carrying conductors wound around the sections of the core, and these must be properly insulated, supported, and cooled to withstand operational and test conditions. The terms winding and coil are used interchangeably in this discussion. The choice of the type winding is largely determined by the rating of the winding. Some of the common types of windings are described below. These windings are suitable for currents not exceeding about 20 A. They comprise of circular cross section(Fig. 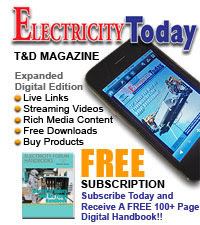 1) and are used for HV windings in small transformers in the distribution range. A number of such coils are joined in series, spaced with blocks which provide insulation as well as duct for cooling. This type of winding is normally used up to 33 KV and low current ratings. 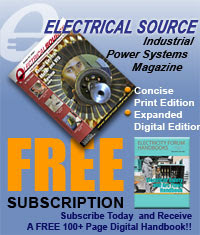 Strip conductors are wound closely in the axial direction without any radial ducts between turns. Spiral coils are normally wound on a bakelite or pressboard cylinder (Fig. 2). Though normally the conductors are wound on the flat side, sometimes they are wound on the edge. However, the thickness of the conductor should be sufficient compared to its width, so that the winding remains twist-free (Fig. 3). Spiral windings may be made as single layer or multilayer type. 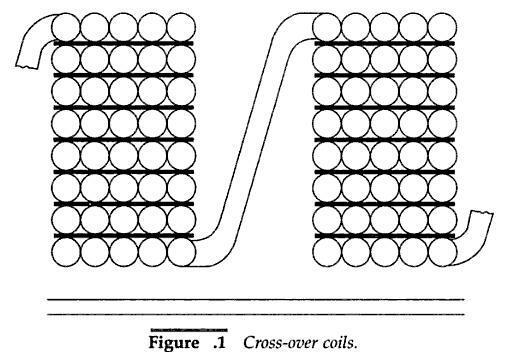 Fig 4. shows a double layer spiral coil where an oil duct separates the tow layers. For such a coil, both the start and the finish leads lie at one end of the coil and may at times prove to be advantageous for making the terminal gear. Normally it is not necessary to provide ant transposition between the parallel conductors of a spiral winding as the lengths and the embracing of leakage flux are almost identical. This type of winding is used in low voltage and high-current ratings. A number of conductors are used in parallel to form one turn. The turns are wound in a helix along the axial direction and each turn is separated from the next by a duct. 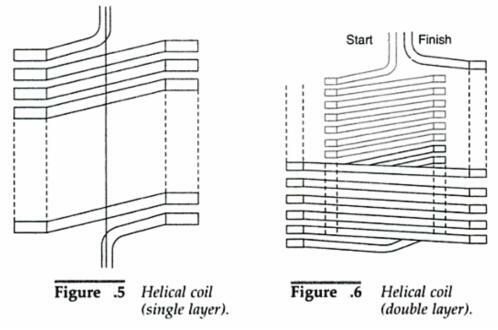 Helical coils may be single layer (Fig 5) or double layer (Fig. 6) or multi-layer, if the number of turns are more. Unless transposed, the conductors within a coil do not have the same length and same flux embracing and therefor have unequal impedance, resulting in eddy losses due to circulating current between the conductors in parallel. To reduce these eddy losses, the helical windings are provided with transposition of the conductors which equalise the impedances of the parallel conductors.